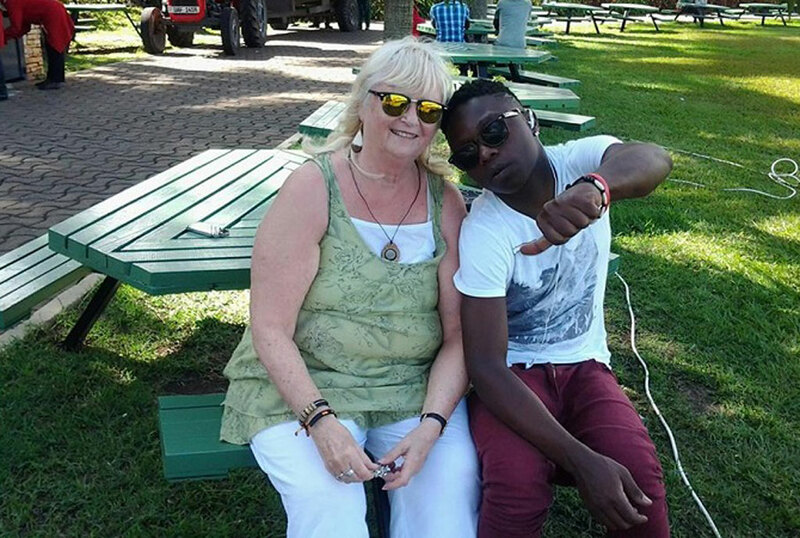 Nineteen-year-old failed singer Aziz Magically (real name Aziz Mwanda) thought he had won a jackpot when he hooked the 85-year-old renowned cougar Mona Lisa Larsson but things are turning pretty bad at an alarming speed. Aziz hooked up with the Swedish national after her public break up with another younger but also struggling artiste, Guvnor Ace. Aziz and Mona Lisa have been a tour of sorts – visiting different media houses professing their love for each other and announcing their wedding date as July 28 at Speke Resort Munyonyo this year. However, over the weekend Spark TV’s Livewire gossip show revealed that the couple had been arrested and held at Jinja Road police station after failing to pay hotel fees after spending a night in the Kayanya-based Fair Miles Hotel. This was shortly after a staff member of another hotel called Palm Gardens Hotel accused the couple of failing to pay accommodation fees amounting to Shs2million after spending four nights in the aforementioned hotel. After the incident, Aziz apologized to his ‘fans’ saying that there was a problem with his fiancee’s credit card which has made them unable to pay any bills. However, his excuse changed yesterday after his was found admitted in Mulago hospital after suffering a big fall in the night. “I woke up last night and I was not feeling well. I tried to get up but I stumbled and fell. My lips cracked and yet I also have a little fever,” he said. Aziz, who was being tended to by Mona Lisa, is said to have collapsed due to hunger since they can barely afford any thing at the moment. “We don’t have even Shs100…that’s the truth. We can’t even find where to stay. My lip has been stitched but I was just helped by a Good Samaritan who drove us here,” he admitted in an interview with Bukedde TV. He asked Ugandans to help him since he is also an African revealing that he is even afraid to go home because his people think he has money. He says that family has shunned him ever since he hooked with Mona Lisa. Meanwhile Mona Lisa was relying on drinking water as she could not afford any food in the hospital. They were helped by traditional herbalist Mama Fiina who saw them on TV. She bought them some gonja and minute maid before taking them with her to an undisclosed location. Mama Fiina is also responsible for rehabilitating failed singer Cute Kaye who was arrested last month for stealing car headlights. Mama Fiina promised to buy an air-ticket for Mona Lisa to be able to fly back to Sweden and give financial support to Aziz instead of wasting his future with the sugar mummy.